Put simply, and we cannot emphasize this strongly enough, USB-C as a term by itself means nothing about data speed or charging ability —it is literally, and only, a description of the physical connector. 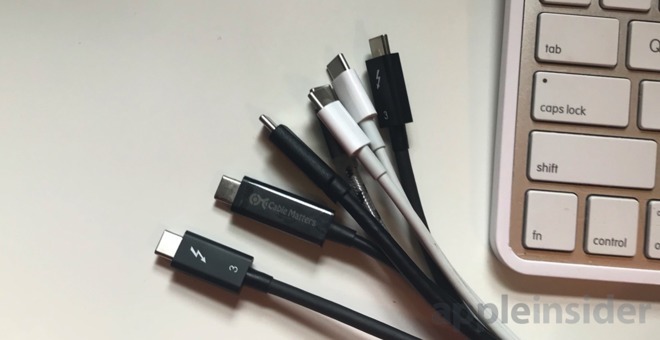 Seven USB-C cables, seven different specs —which is which? Complicating matters somewhat, some Thunderbolt 3 cables can function as a USB 3.1 type C cable —but not all can. A USB 3.1 type C cable is never a Thunderbolt 3 cable, despite having the same connectors. Also, not every USB-C cable —be it Thunderbolt 3 or USB 3.1 Type-C —is capable of providing 100W that is allowed in the specification. In fact, between poor quality cabling available at multiple venues, terrible cable markings, and Apple's obsession for plain white cabling, this is more confusing now, with no improvement in the last two years. Simple enough. But, the Apple-supplied cable is only capable of USB 2.0 speeds, and is in no way a Thunderbolt 3 cable. This isn't unique to Apple, though —most high-power USB-C cables found on Amazon are only capable of USB 2.0 speeds. We've had a pile of very short Thunderbolt 3 cables pass through the testing lab while we've gone through the docks, eGPUs, and other Thunderbolt 3 peripherals. None of them arrived clearly labeled on the cable itself. Some are capable of even 100W. Some aren't. So, that's a problem. We get around that with careful sorting, color-coding, and hanging on a pegboard —but admittedly a surplus of Thunderbolt 3 cables still isn't a common problem. And, if you just need USB 3.1 Type C, just get that. Don't pay the premium for Thunderbolt 3. Be mindful of reviews in addition to maximum power limitations if you're going to charge a 15-inch MacBook Pro. We like the Anker Powerline II USB-C to USB-C 3.1 gen 2 cable for most of our connectivity and power needs given that it is rated for 100W and full 10Gbit/sec speed —but it is only three feet long. As a quick cheat-sheet: Active Thunderbolt 3 cables are high-speed but expensive, and mostly lack USB 3.1 Type-C compatibility —but very new ones might retain it. Passive Thunderbolt 3 cables are generally short for best performance, and nearly always maintain USB 3.1 Type-C compatibility. Neither passive nor active imply anything about maximum charging power, nor are they necessarily labeled on the cable indicating what they are capable of delivering.